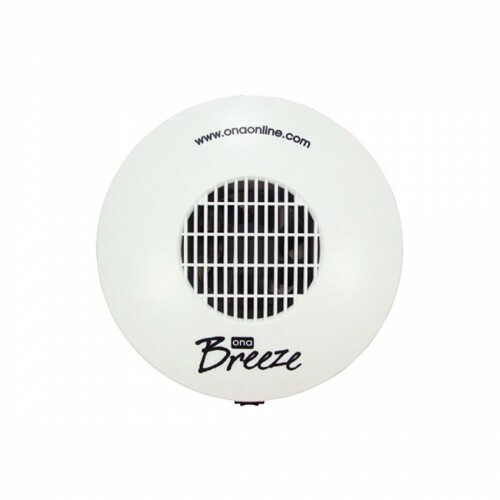 The ONA Breeze Fan Unit fits straight onto the top of ONA 4 litre gel tub or ONA 1 Litre gel tub and gently distributes the ONA odour killing vapours around a medium to large size area up to 140 square metres (1500 square feet). The unit has a fan speed selector switch with 2 fan speeds and an OFF position. In the low setting, the fan is virtually inaudible but gently wafts the ONA odour control into the room space in which it is positioned. The high setting can be used for odour control when the room size is near the maximum size (140 square metres) or for a short time when an extra burst of odour control is required.